This western was the third and final installment (but actually a prequel) in under-rated Italian director Sergio Leone's The Man with No Name epic trilogy. It is perhaps the best-known "spaghetti western" of all-time. The film's opening title sequence included a 20 minute introduction to the three main characters: Tuco "the Ugly" (Eli Wallach), Sentenza "the Bad" (Lee Van Cleef), and Joe "the Good" or "Blondie" (Clint Eastwood). 'The Man with No Name' was Eastwood's star-making role, after he made appearances in the previous A Fistful of Dollars (1964) and For a Few Dollars More (1965). 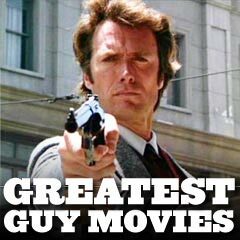 Elements of his character could be found in his later anti-hero cop "Dirty" Harry Callahan character in Dirty Harry (1971). As with Leone's other westerns, this film was viciously violent and machismo in tone, but buoyed by the classic, instantly-recognizable, twanging Ennio Morricone score. With very little dialogue, lots of closeups, and vast widescreen landscapes, the film's plot, set during the Civil War, concerned the acquisition of a treasure chest of $200,000 in stolen Confederate gold buried in a grave at a faraway location. All three of the main characters, basically amoral, anti-social bounty hunters, outlaws, and murderers, were forced to form an uneasy partnership or alliance, leading to the film's climactic graveyard shootout in which the opportunistic desperados found themselves facing off one last time for the fortune. The opening credits sequence to introduce the main characters, and the final cemetery shoot-out scene. Writer/director Richard Brooks' big-budget ensemble western was one of the most exciting action-adventure westerns of all time. It starred Lee Marvin as munitions expert Henry "Rico" Fardan - the leader of a four-man mercenary team. The 'professionals' included Burt Lancaster as dynamiter Bill Dolworth, Robert Ryan as horse specialist Hans Enrengard, and Woody Strode as tracker/longbow expert Jake Sharp). They went into Mexico on a dangerous mission to rescue a wealthy industrialist's ransomed or 'kidnapped' wife (the beautiful Claudia Cardinale) from Mexican rebel kidnappers (headed by Jack Palance as guerrilla leader Jesus Raza, "the bloodiest cutthroat in Mexico") - a job commissioned by Texas railroad tycoon/millionaire Joe Grant (Ralph Bellamy). At film's end, a character reversal was revealed - Maria actually loved the Mexican outlaw and the "professionals' abandoned their "bad deal" mission as Rico explained to Grant: "We made a contract to save a lady from a nasty old kidnapper. Who turns out to be you" - they allowed Maria to leave with Raza. "So what else is on your mind besides hundred-proof women, 'n' ninety-proof whiskey, 'n' fourteen-carat gold?" "The question is, Who are the good guys?" - "We both made a bad deal, Mr. Grant. You lose a wife and we lose 10,000 dollars apiece." - "Yes, sir. In my case, an accident of birth. But you, sir. You're a self-made man." The assault on Raza's compound. Based on Donn Pearce's novel, this chain-gang prison film was a moving character study of a non-conformist, anti-hero loner who bullheadedly resisted authority and the Establishment. The spirited title character was an irreverent, social misfit named Luke (Paul Newman) who was arrested for destroying parking meters and imprisoned in a tough Southern prison farm, commanded by a sadistic, prison officer Captain (Strother Martin). After boxing with the chain-gang boss Dragline (George Kennedy), he eventually became a hero to his fellow inmates, earning the title "Cool Hand Luke" because his will could not be broken. A visit by Luke's dying mother (Jo Van Fleet) revealed facts about his past. The stubborn, unruly and independent rebel refused to submit and continually and cooly defied the authorities with repeated escape attempts. As the inmates started worshipping him as a folk hero, he risked everything in order to live up to their expectations, and was sacrificed in the tragic climax. "What we got here is (a) failure to communicate." "Old Luke, he was some boy. Cool Hand Luke. Hell, he's a natural-born world-shaker." The egg-eating contest, and the soap-sudsing car wash performed by a buxom blonde (Joy Harmon). Robert Aldrich's popular action-war film told about a group of a dozen convicted, death-row military convicts (including Telly Savalas, Donald Sutherland, Jim Brown, John Cassavetes, Charles Bronson, Robert Ryan, George Kennedy and more) sent on a suicide mission (headed by a tough Lee Marvin as Major John Reisman) behind Nazi enemy lines to destroy a French chateau during World War II. It was the ultimate 'guy's' movie with its exciting sequences of the training and then the behind-the-lines suicidal assault (named "Operation Amnesty" composed of 16 separate steps) on a Nazi-filled French chateau by the "Dirty Dozen" - only one of whom survived -- stoic Pole Joseph T. Wladislaw (Charles Bronson). "...It gives you just about the most twisted, anti-social bunch of psychopathic deformities I have ever run into!...You've got one religious maniac, one malignant dwarf, two near-idiots, and the rest I don't even wanna think about!" Jefferson's (Jim Brown) heroic run - to touch off the massive explosion of the chateau after being commanded: "All right, blow it!" This guy film, a classic car-chase/cop film by director Peter Yates, contained one of the screen's all-time best car chase sequences (at up to 110 miles per hour). The car chase scene was a 10-minute sequence filmed with hand-held cameras up and down the narrow, hilly streets of San Francisco as police lieutenant Frank Bullitt (Steve McQueen) chased after criminals in his car through hazardous intersections. The classic chase ended when the bad guys lost control and crashed into a gas station - with a fiery explosion. "Look. You work your side of the street and I'll work mine." The San Francisco car chase scene. This classic western was director/co-writer Sam Peckinpah's provocative, brilliant yet controversial Western, shocking for its graphic and elevated portrayal of violence and savagely-explicit carnage, yet hailed for its truly realistic and reinterpreted vision of the dying West in the early 20th century. Its unrelenting, bleak tale told of aging, scroungy outlaws (the 'wild bunch') bound by a private code of honor, camaraderie and friendship, but they found that they were at odds with the society of 1913. The lone band of men led by Pike Bishop (William Holden) came to the end of the line and were no longer living under the same rules in the Old West, and were relentlessly stalked by bounty hunters, one of whom was Pike's former friend Deke Thornton (Robert Ryan). The film concluded with a spectacular, climactic bloodbath in the open courtyard as the gang took on an entire Mexican soldier regiment and commandered a big machine gun for awhile. The film's opening ambush following a failed bank robbery in a Southwestern Texas border town, and the bloody finale signaled by the courageous, heroic march of the four remaining gang members to face ruthless General Mapache (Emilio Fernandez) and his army for a showdown - a slow-motion massacre-shoot-out as the Wild Bunch suicidally attempted to rescue Angel (Jaime Sanchez) from 1,000 Mexicans.